The grey squirrel was @SpeciesofUK from 10th to 16th March 2013. Grey squirrels (or Eastern Grey Squirrels to give them their full name) are part of the family Scuridae which contains circa 285 squirrel species in total. The only other Scuridae species found in the UK is the red squirrel. Grey squirrels are not UK natives. They were introduced to the UK from the USA in the late 1800s. 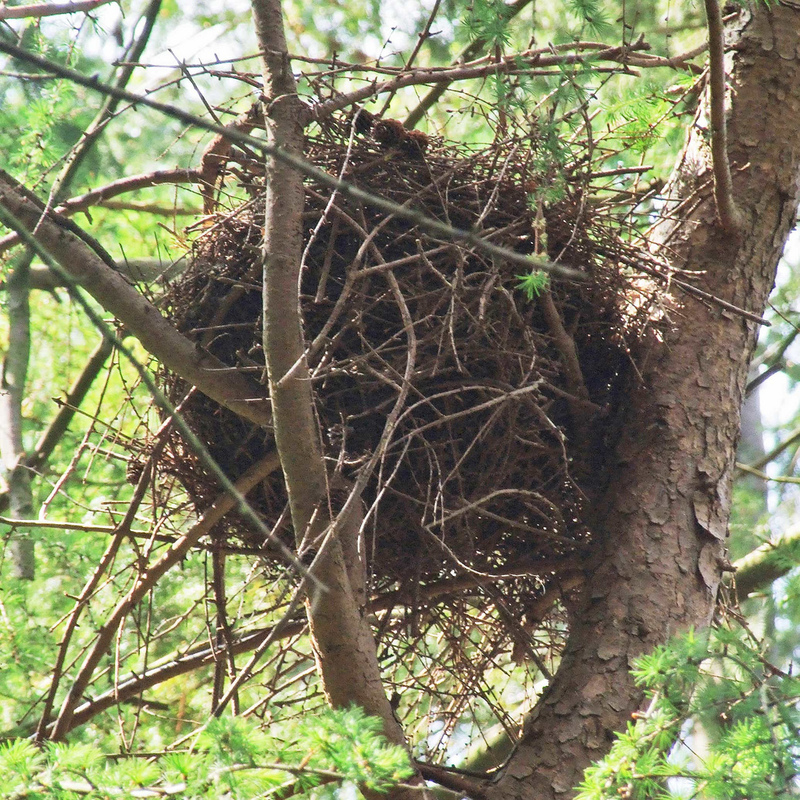 They’ve been rampantly successful, out-competing native red squirrels and driving them into ever smaller outposts. 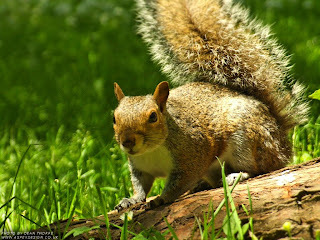 The grey squirrel is a native of north-east America. Allegedly a gentleman called T.V. Brocklehurst released the first one into the UK in 1876, in Henbury Park, near Macclesfield, Cheshire. Grey squirrels are now found throughout most of England, Wales, some parts of Scotland and Northern Ireland, although not in the Isle of Wight or Isle of Man. 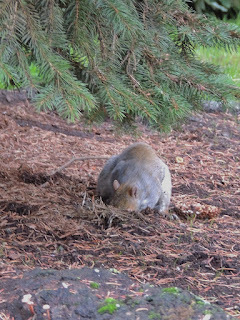 Grey squirrels do especially well in urban areas because they are not fussy about their habitat needs. Just a few trees and a few bird feeders will do. Remarkably, the grey squirrel is absent from mainland Europe bar some pockets in Italy. Unsurprisingly, there are concerns that the grey squirrel will spread from Italy across the rest of Europe, like it has in the UK. Grey squirrels are very easily distinguished from red squirrels. They are much larger, have no tufts on their ears, and grey over much of their fur. Grey squirrels frequently have patches of reddish-brown fur. Some people suppose this is cross-breeding with red squirrels but it isn’t. It’s natural colouration. There are two very interesting populations of grey squirrel in the UK that have very different coloured fur - the white squirrels and black squirrels. These are not subspecies. They’re just colour variations on the grey squirrel. 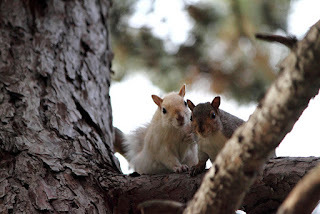 If you see a white squirrel with pink eyes, however, it's not a "White Grey Squirrel," it's an albino. Several other variations in colour are possible but rare. 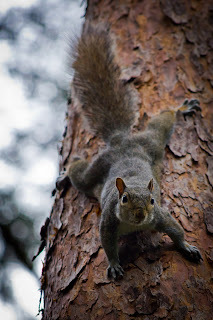 Grey squirrels are active during the day. They are expert foragers, looking for food in trees or on the ground, and even from bird feeders. Grey squirrels eat acorns, bulbs, tree shoots, buds, fungi, nuts and roots. They love hazelnuts, feasting on them by breaking the shells in half. Being a rodent, grey squirrels’ front teeth grow continually so it’s essential they keep eating nuts and seeds to grind them down. In the autumn, grey squirrels bury acorns and other nuts. They find them in the winter using their spatial awareness and strong sense of smell. Even so, many caches of nuts are left uneaten, enabling new trees to be dispersed throughout the woodland. 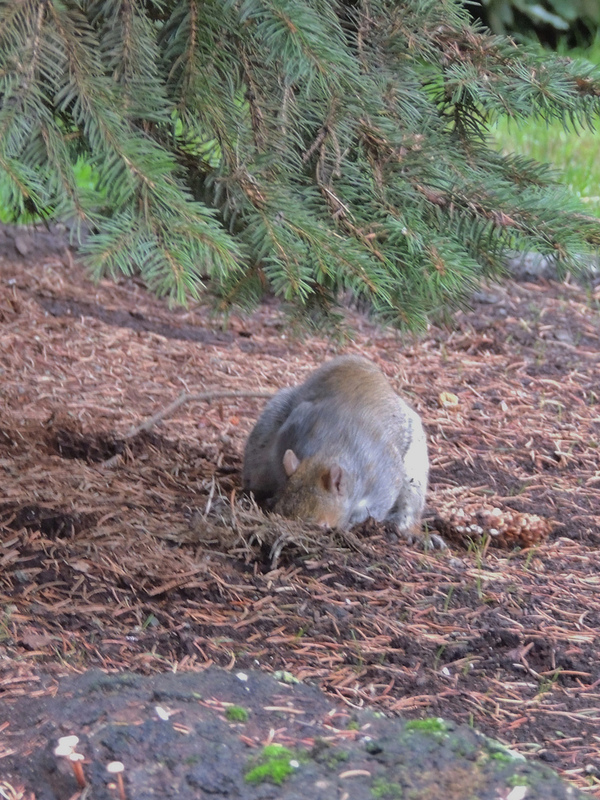 One of the nastier habits of the grey squirrel is to chew the bark off trees to get at the fleshy material underneath. They can sometimes kill the tree. 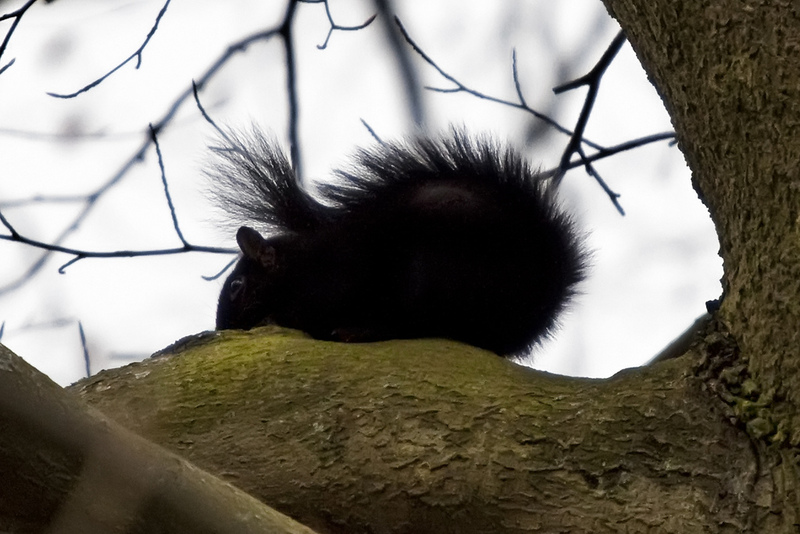 In the winter, grey squirrels are much less active. They don’t hibernate, but they can sleep for several days at a time. 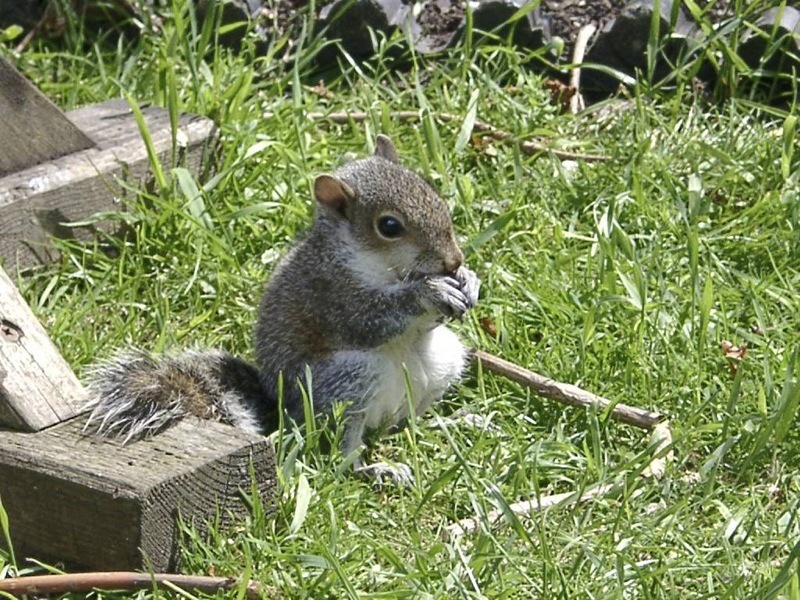 Grey squirrels tend to breed in between January and April and, if food is plentiful, they may have a second litter in the summer. There are normally two to six young in each litter, so one pair of grey squirrels could produce ten or more young in a single year. 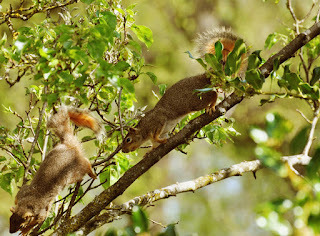 In the breeding season you can often see males chasing females throughout the treetops, and hear their screeching calls. 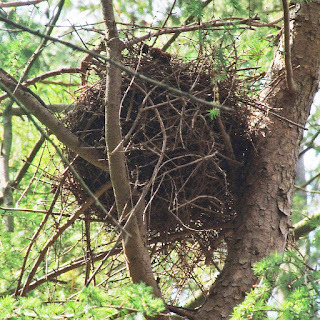 The grey squirrels’ nest, called a drey, is a compact, spherical structure. It is slightly larger than a football and constructed of twigs, leaves, bark and grass. In the summer the drey looks like a leafy platform but in the winter it is deeper and acts as the nursery for the young. 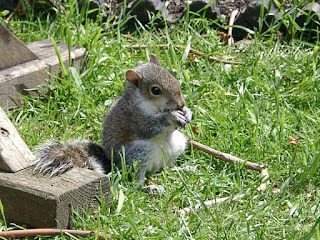 Young grey squirrels are weaned at 7 weeks and leave the nest after 10 weeks. 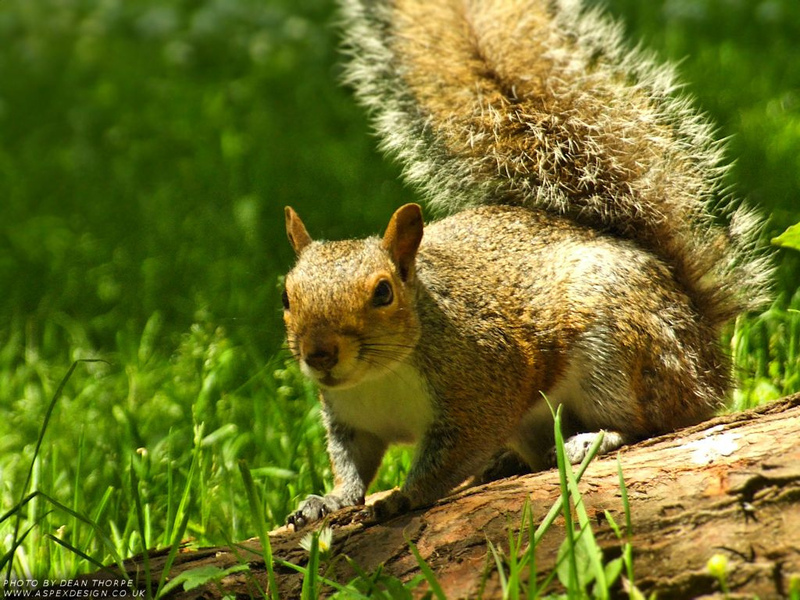 Grey squirrels live up to about six years. Grey squirrels, being recent rivals to the UK, are of course branded as "non-native." But native-ness of species is a controversial topic. If you go far enough back in history many species prove to be arrivals from elsewhere. One common definition of native species is that they were present in the UK in the period after the last Ice Age. By this definition red squirrels are native to parts of England but almost certainly aren't native to Scotland, despite that being their main stronghold now. Many non-native UK species are now well-loved: fallow deer, hares, little owls, green lizards and rainbow trout are all introductions to the UK. 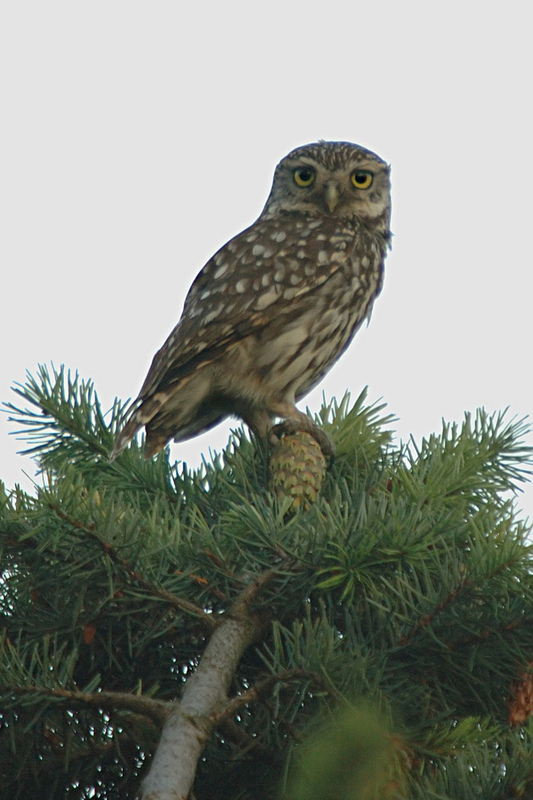 The little owl, for example, was introduced to the UK at around the same time as the grey squirrel, but is much more well-loved. Since arriving on these islands, grey squirrels have out-competed red squirrels almost everywhere. 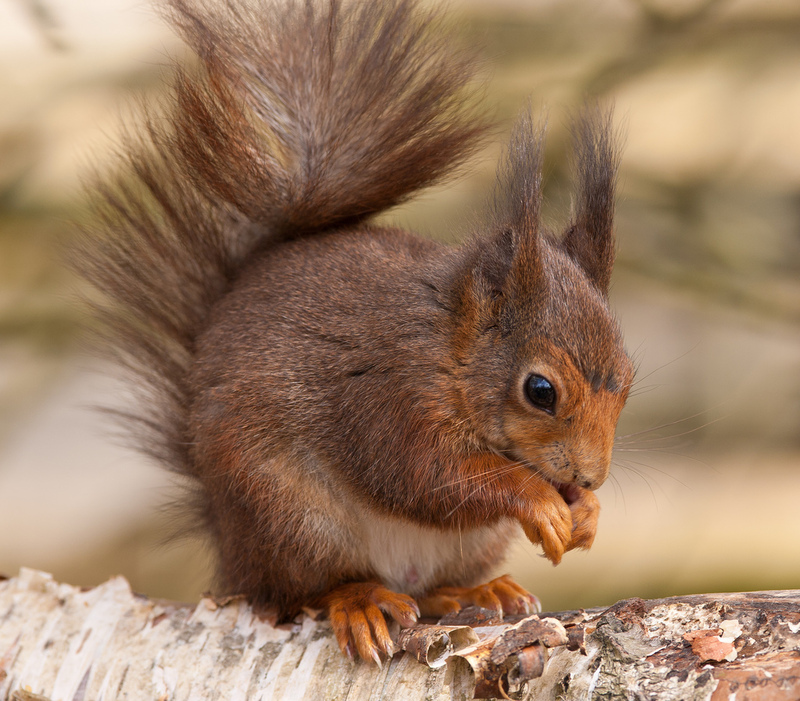 The squirrel pox virus kills pretty much 100% of infected red squirrels within a few days. It’s absolutely deadly to them. Squirrel pox is now spreading to Scotland. 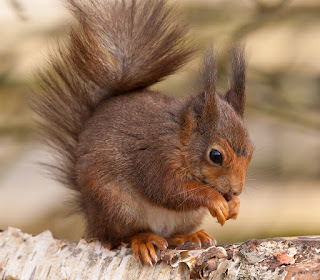 The first death of a red squirrel in Scotland from squirrel pox was near Dumfries in 2007. 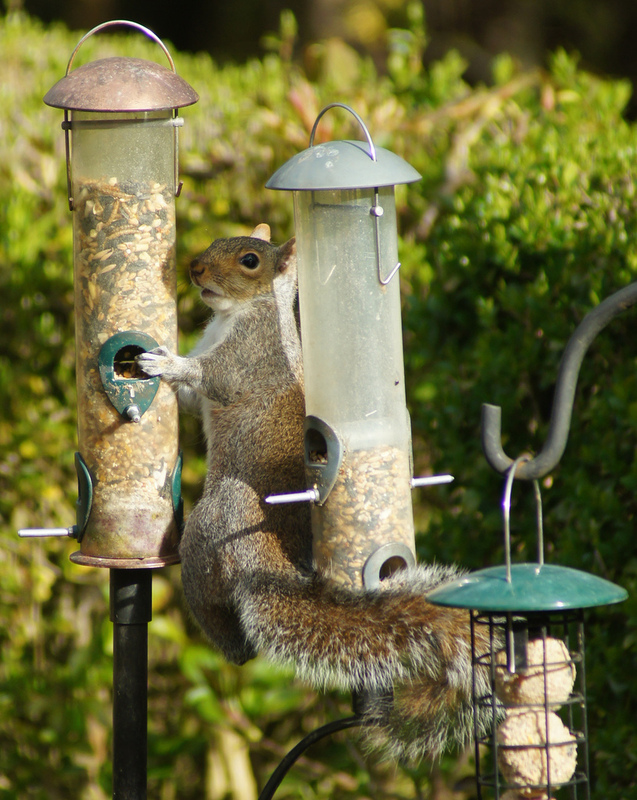 There has been lots of talk of ways to control grey squirrels spreading further, and in some areas they are systematically trapped and culled. It’s even been suggested the red squirrels could be introduced to the Isle of Man to create a protected enclave from grey squirrels. Recently, a heart-warming story has emerged about research that shows that pine martens help prevent the spread of grey squirrels. They predate grey squirrels whereas reds are too small and agile. It is a great story of one native species supporting another. Pine Marten, Scourge of the Grey Squirrel? 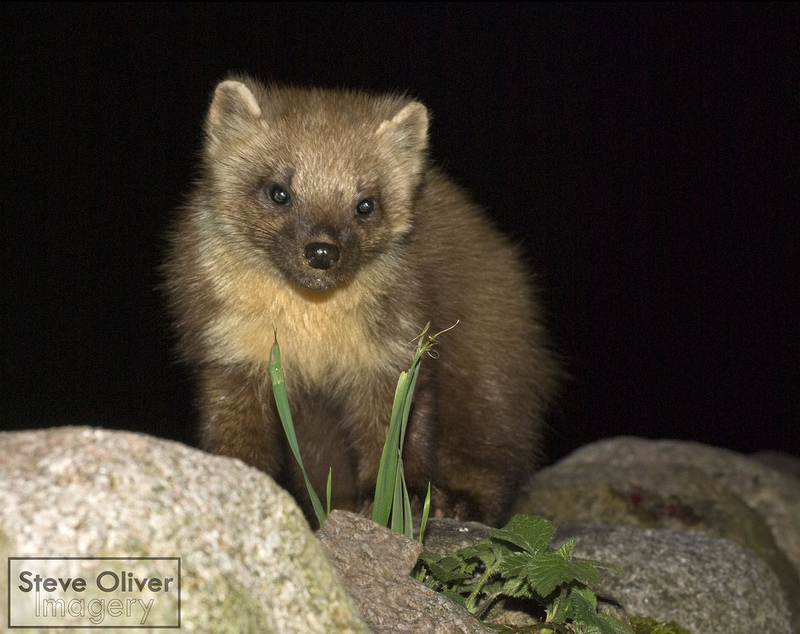 Pine marten numbers are on the rise, raising hopes that they will continue to drive back grey squirrels from Scotland. Grey squirrels (and indeed red squirrels) occasionally eat bird eggs and even kill and eat chicks. Thank you. They are certainly a tricky capture!